Q: I heard that taking more than the Recommended Dietary Allowance of vitamins and minerals will just give me expensive urine. Isn’t eating good food—and plenty of it—enough? A: To be healthy and achieve your goals in gaining muscle and losing fat, it’s essential to get an adequate amount of nutrients. One problem with trying to get everything from food is poor soil quality. According to clinical nutritionist Dr. Robert Rakowski, it takes 17 elements to make a healthy plant, and the most popular fertilizers used on crops replace only three of them. The result is that we are consuming malnourished plants, and the animals we eat are consuming malnourished plants. Eating organic will help, but often it’s not enough. Next, consider that there is controversy about the recommended daily allowances promoted by the United States Institute of Medicine, which are based on a nutrition model in which a deficiency of a particular nutrient is associated with a single, particular disease. Scientists identify adequate intake by finding the population that has the lowest intake of the nutrient in question and also doesn’t have the disease in question. Basic nutrition courses often discuss the scurvy suffered by European explorers during their long sea voyages. Portuguese explorer Ferdinand Magellan, for example, lost 200 of his 218 crew members to scurvy during his expedition to the Philippines from a lack of vitamin C in their primary diet of salt beef, salt fish and rye flour crackers. The part of the story people seldom hear is that officers on such voyages often brought potatoes, which contain vitamin C, and as such had protection from scurvy. Likewise, Chinese sailors who remained at sea for months didn’t get scurvy because their sea-bound diet included bean sprouts, which contain vitamin C. The takeaway point is that it takes very little vitamin C to prevent this illness. Even so, a deficiency of even a single nutrient can affect physical performance, so I consider it essential to take a good multivitamin-and-mineral supplement. There are several specific nutrients that I think need special attention. The three that are the most commonly deficient in my clients are magnesium, zinc and vitamin D.
To recap, the problem with just going by nutrient recommendations is that each is set for the lowest possible level of the nutrient that prevents the physical symptoms of a serious disease. Most of us want to do more than avoid a potentially fatal disease—we want to be in top health. 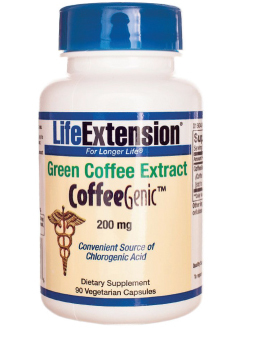 It’s the latest fat-loss miracle, touted even by Dr. Oz: green coffee extract. According to the December ’12 Health, Oz tested green coffee extract on 100 overweight women in his audience. He gave the supplement to half the group and a placebo to the other half. All were instructed not to change their eating or exercise habits. They took one pill 30 minutes before each meal for two weeks. Results? The green-coffee-extract group lost two pounds on average in two weeks while the placebo group only lost one pound. That’s a doubling of weight-loss results. Good stuff! Plus, it may help you keep the weight off—even after you stop taking the supplement. In a recent study published in Diabetes, Metabolic Syndrome and Obesity: Targets and Therapy, 14 of 15 subjects had not regained any of the weight they lost four months after they stopped taking the supplement. Lead author of the study, Joe Vinson, Ph.D., said the reason may be that the supplement helps “reset your body mechanisms” that affect metabolism. Apparently, weight loss initially occurs as a result of the polyphenols in green coffee extract, which slow the absorption of carbohydrates, sugar and possibly fats in the digestive system. “They also inhibit an enzyme used by the liver to form blood sugar,” meaning you get less insulin release and subsequent fat storage. If you want to try it, research suggests that about 400 milligrams taken three times a day—30 minutes before breakfast, lunch and dinner—produces the best results. And, no, you don’t get it from drinking coffee. Unfortunately, the key polyphenol, chlorogenic acid, is destroyed in regular coffee beans during the roasting process. According to the winter ’12-’13 edition of Life Extension, even people who are taking vitamin D supplements are deficient in this important vitamin. Many people think that getting 400 to 600 I.U. in their multivitamin is enough. It’s not, especially if you are older. “Aging persons need to supplement with about 5,000 I.U. of vitamin D each day to achieve optimal blood levels. This is about 10 times more than the typical American takes.” You should also take the majority of that dose with the meal that contains the most fat to get maximum absorption. That’s the last meal of the day for most people. A number of studies have established that zinc is essential to protect against oxidative stress and help repair DNA damage. In someone who has a zinc deficiency, the risk of which has been shown to increase with age, the body’s ability to repair genetic damage may be decreasing even as the amount of damage increases. Recently, Emily Ho and colleagues from Oregon State University studied a lab animal model for the cellular zinc transport mechanisms. Finding that zinc transporters were significantly dysregulated in old mice, the team observed that aged animals showed signs of zinc deficiency and displayed an enhanced inflammatory response even though their diet supposedly contained enough zinc. Wong, C.P., et al. (2012). Increased inflammatory response in aged mice is associated with age-related zinc deficiency and zinc transporter dysregulation. J Nutr Biochem. In press; published online Sep 13. There has been a multitude of recent research concerning the health-restorative benefits of a number of power foods and fruits—including acai (pronounced ah-sigh-ee), apple extract, blueberries, grape seed extract, noni juice and pomegranate, to name a few. All appear to contain nutrients with powerful medicinal properties. Research has confirmed that these supernutrients can combat cancer and diabetes, reduce cholesterol and inflammation and help prevent heart disease. These foods are super because of their high orac value. Orac is the abbreviation for oxygen radical absorbance capacity, a measurement of the antioxidant capacity of a given food. Antioxidants protect cells from free radicals, which are nasty molecules that damage DNA and accelerate aging and muscle wasting. While health officials are alerting the public about the medicinal benefits of these superfruits, sports physiologists have begun alerting the sports nutrition community about their recovery-accelerating and fat-reducing benefits. In fact, over the past few years the acai berry has been well publicized for its high orac value, as well as its amino acid content. Because acai has an orac value around 5,500, researchers are excited about its ability to help maintain health, energy and vitality. Also, based on the results of a growing body of evidence, acai has the ability to assist the body in fat-loss via its effects in speeding up the metabolic rate, without disrupting or overriding normal metabolic processes. Additionally, acai’s high amino acid content makes it a valuable aid in muscle repair and growth while slowing the catabolism, or muscle wasting, that typically occurs during high-intensity workouts. Finally, because of acai’s ability to speed up the metabolic rate, users have reported renewed energy and vitality following a workout. In a related study researchers at Stockholm University found that five weeks of drinking 150 milliliters per day of tomato juice standardized with 15 milligrams of lycopene, substantially reduced levels of 8-dihydro-2”-deoxyguanosine, a key marker of oxidative stress. Studies indicate that this inflammatory chemical can elevate to levels 42 to 82 percent above normal during periods of intense exercise. The researchers reported that after five weeks at the dose ranges cited above, the activity of 8-oxodG was barely detectable. So tomato juice’s antioxidants appear to turn off inflammatory signals that inhibit recovery and accelerate muscle fatigue, giving it a definitive role in accelerating recovery from intense workouts. While glucosamine and chondroitin have been touted as a great combo for relieving joint pain and strengthening soft tissue, SAMe may be even better. In addition, the May ’12 Bottom Line Health had an item on a 2002 study that found SAMe to be just as effective as imipramine at reducing symptoms of mild-to-moderate depression with far fewer side effects. That’s a health double bonus with SAMe. More testosterone? Yes, please. Bodybuilders know that more T equals a rise in strength and size, so optimizing your levels makes sense for the best gains possible. The latest supplement in the up-your-T category is Gaspari Nutrition’s Anatropin, and it can get yours soaring via a number of key ingredients that have been effective in human trials. Vitamin D3 and zinc. Emerging research demonstrates the effectiveness of these ingredients when it comes to boosting testosterone. If you don’t get enough, testosterone falls. Aphrodisiac compounds. Ayurvedic herbs have been used for centuries to support male vitality. Gaspari researchers scoured the globe for the ones that work best and included them in Anatropin. And, no, they did not include tribulus terrestris. Human research clearly shows that trib has no effect on androgen levels in men. The Anatropin proprietary blend lists velvet bean extract (seed), Brassaiopsis Glomerulata extract (leaf) and Anacyclus Pyrethrum DC extract (root). So Anatropin contains a key vitamin and mineral along with multiple herbs that have been found to heighten androgen and libido in men. Sounds like an excellent mix for a testosterone fix. Do electrolyte drinks really help prevent cramping? Q: What’s the deal with electrolyte drinks? Do they really help prevent cramping? And what about potassium? A: Electrolyte drinks may help. Electrolytes are chemical substances that when dissolved in water transform into ions, which are molecules that are involved in conducting electrical impulses throughout the body. If there is an electrolyte deficiency, the muscles will not be able to contract properly. If you drink only plain water, the electrolytes in your tissues become diluted. To restore the electrolyte balance, the body must excrete this water through the kidneys, carrying electrolytes with it. Even so, there’s more to this story. In a study published in the April ’05 Journal of Athletic Training, 13 college-age men with a history of exercise-associated muscle cramps participated in an experiment to determine how well electrolytes could prevent cramping in the calves. The authors concluded, “Consumption of a carbohydrate-electrolyte beverage before and during exercise in a hot environment may delay the onset of exercise-associated muscle cramps, thereby allowing participants to exercise longer.” The authors did note that 69 percent of the subjects still experienced cramping from their training, suggesting that addressing other factors, especially physical conditioning, is necessary to prevent cramping. One of the best natural sources of electrolytes is coconut water; another option is to add an electrolyte-replacement mix to your water. As for some of the popular sports drinks, consider that water enters the cells through a process called osmosis. Sports drinks often have such a high concentration of sodium (to improve the taste) that the water cannot get into the cells—in effect, you are hydrated and dehydrated at the same time! You asked about potassium. Potassium is an alkalizing mineral, and it is also associated with the prevention of muscle cramps. I like potassium citrate, which is highly absorbable. Potassium deficiency is not the only mineral-related cause of cramping. Magnesium is involved in muscle contraction as well, and it is the most common mineral deficiency I see in athletes. One reason is that resistance training increases magnesium requirements. In fact, during the last 12 years not one of the first-time trainees I’ve worked with has had acceptable magnesium levels. Compromised absorption will generally keep you from having optimal levels. Over the years, I have accumulated extensive research and experience in restoring magnesium levels, and I believe it’s best to use a combination of four different magnesium complexes: magnesium taurate, magnesium glycinate, magnesium fumarate and magnesium orotate. Adding vitamins E and D3 will also help. Vitamins A and C are among the most underutilized anabolic fire starters. Not only do they assist in igniting a variety of anabolic processes, but they also help make and sustain many of the physiological chemicals needed for what could be referred to as your anabolic equilibrium and/or your anabolic drive. Vitamin C and the cortisol connection. Known as the master nutrient, vitamin C is water-soluble and not stored in the body. Emerging studies have shown that it can significantly reduce muscle soreness and enhance your recovery time after a workout in doses of 1,000 milligrams. Simply put, elevated cortisol is not a catabolic fender bender; it’s a multicar pileup! Bottom line: Take vitamin C every day—as if your potential to stay in a state of anabolic equilibrium depends on it. C’s other anabolic actions. This vitamin also plays a key role in building collagen, the most abundant connective tissue in the body. Collagen assists in healing joints, dings and other injuries, another reason vitamin C is critical to accelerating recovery. Furthermore, vitamin C has powerful antioxidant capabilities that can protect your muscles from damage that could inhibit you from reaching your full growth potential. It’s also involved in the production and distribution of steroid hormones throughout the body, a fact that isn’t highly publicized. Suggested dose: 1,000 to 3,000 milligrams spread throughout the day. Vitamin A and the testosterone connection. Researchers now know that vitamin A in the testes increases testosterone secretions and a number of anabolic growth factors, including a protein known as steroidogenic acute regulatory protein. It helps transport cholesterol into the mitochondria—the power plants, or energy factories of the cells, where fat is burned. Vitamin A also works as an aromatizing agent in the testes, reducing the formation of estrogen, and so increasing circulating levels of testosterone.